Home Blog Is Uganda Ready for the Conversation on the Minimum Wage? 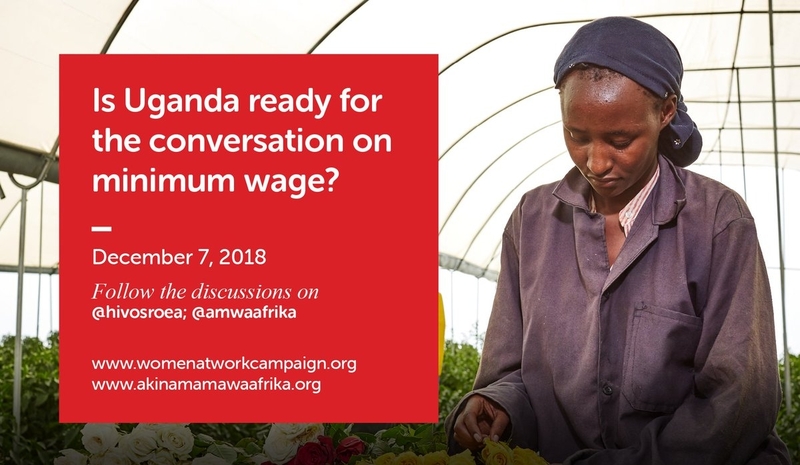 Hivos in partnership with Akina Mama wa Afrika hosted a high level roundtable discussion on the minimum wage titled, “Is Uganda ready for the conversation on the minimum wage?” on 7th December 2018 at Protea Hotel in Kampala. The main objective of the conversation was to influence efforts towards decent work for employees through securing a minimum wage in Uganda. The minimum wage in Uganda has not changed since 1984 making it no longer feasible to respond to economic needs as the Uganda shilling has depreciated and the cost of living has risen, making the wage impractical and exploitative. The Minimum Wage Bill 2015 has been presented before parliament but has also since stalled. The conversation was also intended to the situate the gendered impacts of the absence of a minimum wage on women working in the horticultural sector, making a clear case for why it is needed. 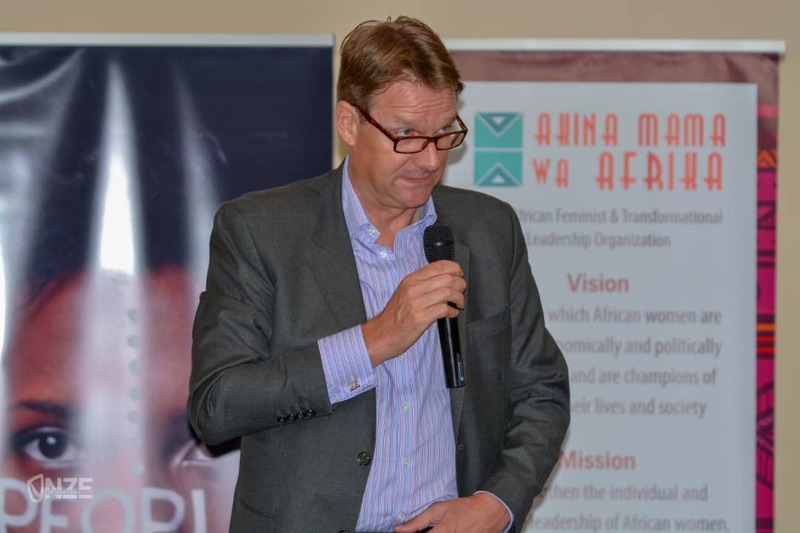 Ambassador Henk Jan Bakker of the Embassy of the Kingdom of the Netherlands in Uganda in his opening remarks emphasized the importance of the minimum wage, stressing that every country needed one. He contrasted the different lived realities of a young person in the Netherlands earning a minimum wage and an adult in Uganda with no such entitlements. A 19 year old makes a minimum wage of Euros 785, and a 22 year old, Euros 1269 setting them on path of economic security which is out of reach for majority of Ugandans. The minimum wage in the Netherlands is controlled by Dutch labour law and is reviewed twice a year. He stressed however that minimum wage should not be sought in isolation of secondary terms of employment such as health benefits and maternity leave. 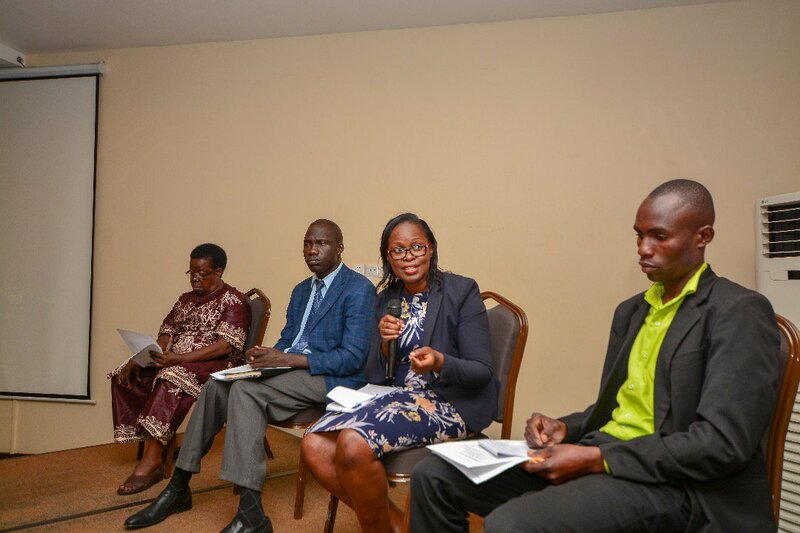 Ms Anita Ntale, a Research Analyst at the Economic Research Policy Centre presented a paper on the ‘State of minimum wage in Uganda’ which sought to lay a firm foundation for the discussions on this issue. The paper traced the history of the minimum wage policy process in Uganda. It showed that the wage had been set at UGX 6000 in 1984 and many efforts to review it had been thwarted. The incumbent Minimum Wage Advisory Board made a recommendation for a rate of UGX 136,000. The paper states that vulnerable groups like women, people with disabilities and other historically disadvantaged people do not have the bargaining power to demand for higher wages in low skilled sectors. This situation is exacerbated in the Ugandan context because of its labour market structure. A panel composed of Mr. Apollo Onjoma, Acting Commissioner, Labour, Ministry of Gender Labour and Social Development; Ms Teopista Ssentongo, General Secretary, National Union of the Cooperative Movement and Allied Workers-NUCMAW and Former Workers’ Member of Parliament; Ms. Grace Mukwaya Lule, Executive Director, Platform for Labour Action; and Mr. Julius Kikomeko Vice National Chairperson, Uganda Horticulture Industrial, Service Providers and Allied Workers’ Union-UHISPAWU raised a raft of issues pertinent to the minimum wage process and labour rights in Uganda. Panelists largely agreed that the proposed minimum wage of UGX 136,000 is insufficient to adequately respond to basic needs of a Ugandan worker. Julius Kikomeko in illustrating this noted that for a single person, rent for a reasonable low cost house is UGX 60,000. Factoring in food and transport expenses, one would need UGX 165,000 as a minimum. For someone with children to send to school, one would need at least UGX 200,000 to survive. Ms Teopista Ssentogo then explained how workers are presently faring in the absence of a minimum wage, many unable to pay rent and facing difficulty in keeping their children in school. Ms. Grace Mukwaya Lule painted a picture of destitution and desperation for many low wage workers, with some workers unable to afford transportation costs to attend the funeral of a loved one. Without a minimum wage, employers cannot therefore be held accountable for paying workers low wages. The Acting Commissioner, Labour, Ministry of Gender Labour and Social Development, Mr Apollo Onjoma, when asked how the ministry was dealing with issues of exploitation of workers in the absence of minimum wage protection, he stated that Labour Officers are on the ground to follow up on employee complaints. However this assertion was refuted by all other panellists who claimed that Labour Officers are non-existent in the field. Also present was the Chairperson of the Wages Advisory Board, Mr Chris Kanya who expressed his frustration with the slow pace with which the government has responded to the Board’s recommendations. The Board wrote a report on the minimum wage which was handed to the Ministry of Gender, Labour and Social Development in 2017. However, no action has been taken since. He also reiterated that minimum wage legislation does not drive away investors as had been claimed by some public officials, including the Ugandan president.